At the age of 13, you leave your parents, go to the city to learn a job and aiming to build your own trade empire at the time of real commercial and though exchanges expansion. You choose the city, each one has its difficulty level, you choose your parents, whose respective jobs predispose you to have specific qualities, and you choose your business among the old fashionned Middle Age jobs. Run your own business, manage your workers properly as to be the more productive you can, and hire guards to protect your goods... Because even if you get better than the competitors, they can destroy your work and your goods... That's the difficult world of business affairs! 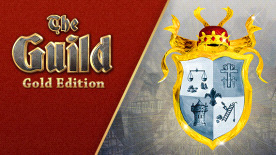 The Guild/Die Gilde/Europe 1400 © 2014 by Nordic Games Licensing AB, Sweden. Licensed exclusively to Nordic Games GmbH, Austria. Developed by 4HEAD Studios. JoWooD, DreamCatcher and The Adventure Company are labels of Nordic Games Licensing AB, Sweden. All other brands, product names and logos are trademarks or registered trademarks of their respective owners.